UPDATE: This contest is now closed. 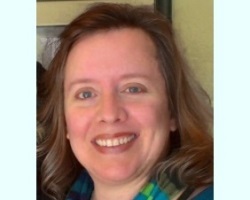 Congratulations to this week's winner, Brenda Munson! If you are Brenda, please see our reply to your comment below to find instructions for claiming your prize. Thank you to everyone who entered, and keep reading the Homecoming Insider newsletter for more fun giveaways! Welcome to this week's Homecoming Insider giveaway! 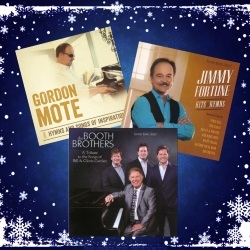 Enter now for your chance to win a prize package including CDs from the Booth Brothers, Jimmy Fortune and Gordon Mote! To enter, simply comment below and let us know why you'd like to win this book. Only one comment per person, please! The deadline for entering is Sunday, December 4, and our winner will be randomly chosen and posted to this page no later than Tuesday, December 6, 2016. IMPORTANT: If you are the winner, we will notify you ONLY by posting your name on this page and announcing it in the next Homecoming Insider newsletter. It is your responsibility to check back here on or after Tuesday, Dec. 6, to see if you are the winner and get instructions for claiming your prize. If the winner has not claimed his or her prize within two weeks, it will be forfeited and may be featured in a future giveaway. In this musical collection of Gaither-penned favorites, the Booth Brothers offer their smooth three-part harmonies and heartfelt interpretations of songs that have inspired their art and faith over the years. This tribute to Bill and Gloria Gaither's music offers encouragement and perspective through songs that have stood the test of time, yet remain as relevant today as they were decades ago. This album features some of Fortune's classic Statler Brothers hits, in addition to top gospel hymns. 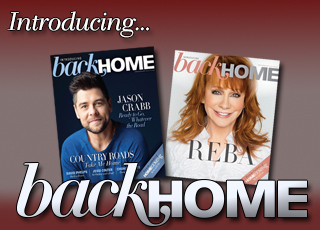 And some of country and gospel music’s top artists join in as guest and background vocalists, including Vince Gill, the Isaacs, Charlotte Ritchie, Dailey & Vincent, the Oak Ridge Boys, Ricky Skaggs, the Gaither Vocal Band, the Whites and more! Standout pianist, producer, and performer Gordon Mote offers this exquisite collection of history's favorite hymns and current worship hits. Join the Gaither Homecoming favorite for performances of "I Surrender All," "Because He Lives (Amen)," "Amazing Grace," "Just As I Am" and more.